“I would start about Thankgiving cooking for Christmas and would freeze all kinds of goodies. The cutout cookies were one of the first things to go in the freezer and then the cakes. I made enough cakes for me and Mama, which was usually at least eight all together. Everybody’s favorite was the coconut, which I finally quit making because the coconut was ruining the porch carpet as were the crumbs from Mary Carol’s favorite, the Waldorf red, which contained two bottles of red food coloring. “For nearly forty years I made candy at Christmas to give to all our friends and to get fat on ourselves. One years I made twenty different kinds. We would dole out some thirty boxes each Christmas and the kitchen would be hopelessly sticky for months. I’m sure a psychologist would have had a field day with Sara and Christmas. Somehow this holiday of holidays brought out her inner child, her creative streak, her penchant for perfection and her generous nature. For weeks on end, the candy rolled out of the oven and across the kitchen counters, and cute Christmas plates were crammed with pinwheels and divinity and bourbon balls and fudge and those elaborately decorated teacakes. When it reached the point that the Crisses had nowhere to put down a supper plate, it was time for “the list” to be made and we fanned out around Greenwood with these much-anticipated plates of sugary wonders. You and I have both seen the looks on the faces of folks who appreciate your thoughtfulness but who really don’t want whatever culinary offering you’ve brought to their doorstep; that look was never seen when Sara showed up with goodies. 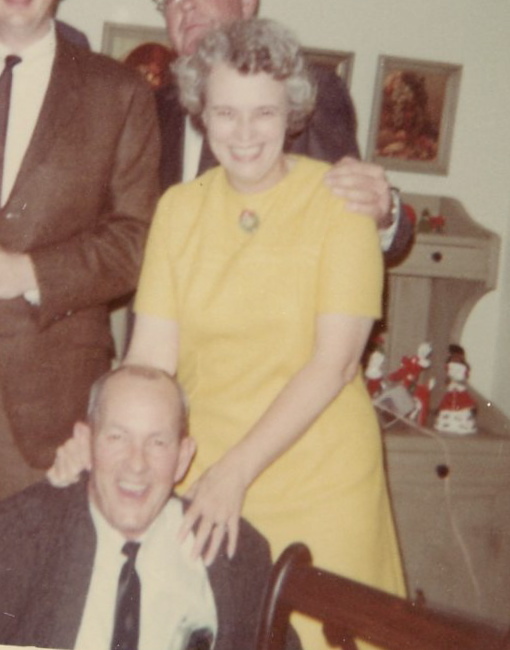 She was the master of the Domino’s sugar bag and the Bundt cake pan and if you were on her candy list, you were one lucky family. I’ve already posted about Christmas Eve at 409 East Adams, an event that those who attended will never forget or manage to reproduce. What I may not have mentioned is that every square inch of the house would be decorated. Bows up the banisters, dolls and dollhouses and manger scenes on every table, Victorian carolers on the front hall coatrack, Norman Rockwell houses on the mantel, Christmas bedspreads, red and green throw pillows, holly-design curtains, even the infamous red and white Christmas toilet paper that sent Tiny into a tailspin when she thought she was having a GI hemorrhage. If you stood still at our house from mid-November on, you were likely to be decorated. And as the years passed and Cathy and I grew up and went to our own homes, Sara filled much of her time with making even more decorations and trolling Big Lots and Patsy’s junk shop for more knick knacks and “cute things.” The attics filled up, and the tradition which Jeff, Jenny, Emily and Jim will always hold dear was Thanksgiving afternoon, post-Betty Jane’s turkey and rolls, making dozens of trips up and down those stairs carrying Santas and dolls and wreaths and garland and The Christmas Tree. Sara perfected the art of decorating styrofoam balls and must have made 500 of them, and her tree was a wonder to behold. 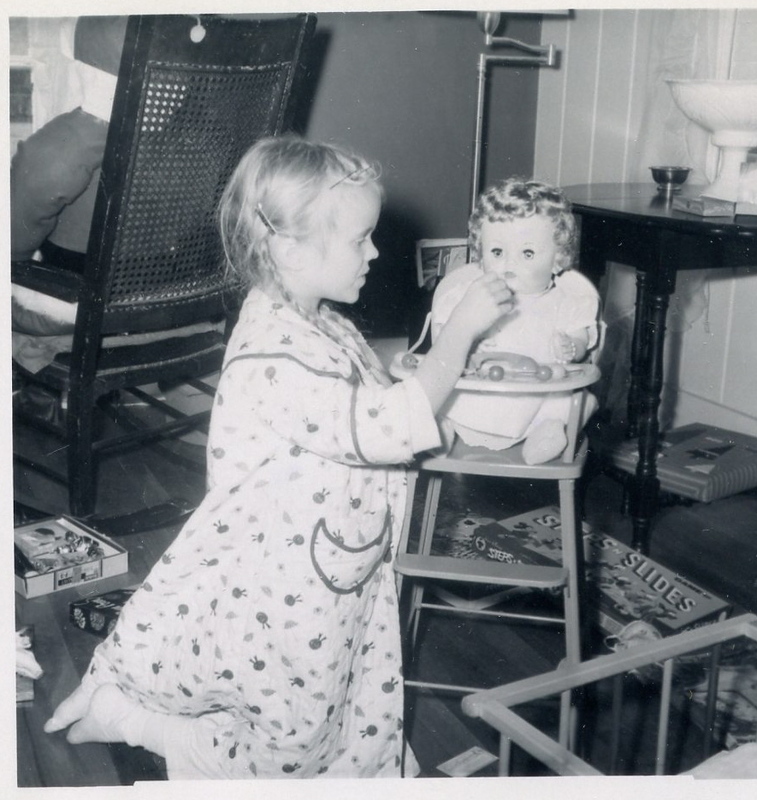 She ringed it with her famous dolls and would sit in the living room for hours on end, just admiring her handiwork. Well deserved rest. After the marathon of Christmas Eve, it was hard to wind down and get ready for Santa. Cathy and I would be tucked in in our pine-paneled front bedroom, wound as tight as springs, listening for Santa to tiptoe in the front door. (We had a mantel but no chimney…..go figure.) Cathy always managed to slip in some kind of little alarm clock and the set-off time crept backwards every year, to the point where we were bouncing out of bed, through the little closet that connected the downstairs bedroom and into Sara and Russell’s room by 4 a.m. Sara was as excited as we were and bailed right out of bed, but Russell was not amused. While we paced the kitchen, he disappeared into the bathroom and I honestly thought he would never, never come out. Years seemed to pass. He would finally emerge in his old plaid bathrobe, cigarette in hand, and shuffle into the kitchen for coffee. At which point Cathy and I burst through the kitchen door into the living room, where dark shapes and all the magic of Christmas lay waiting. When Sara flicked on the lights, there were toys and books and bikes and playhouses and more than you can possibly imagine. Russell would take his seat on the couch with a cup of coffee and watch his girls squeal and laugh and compare. 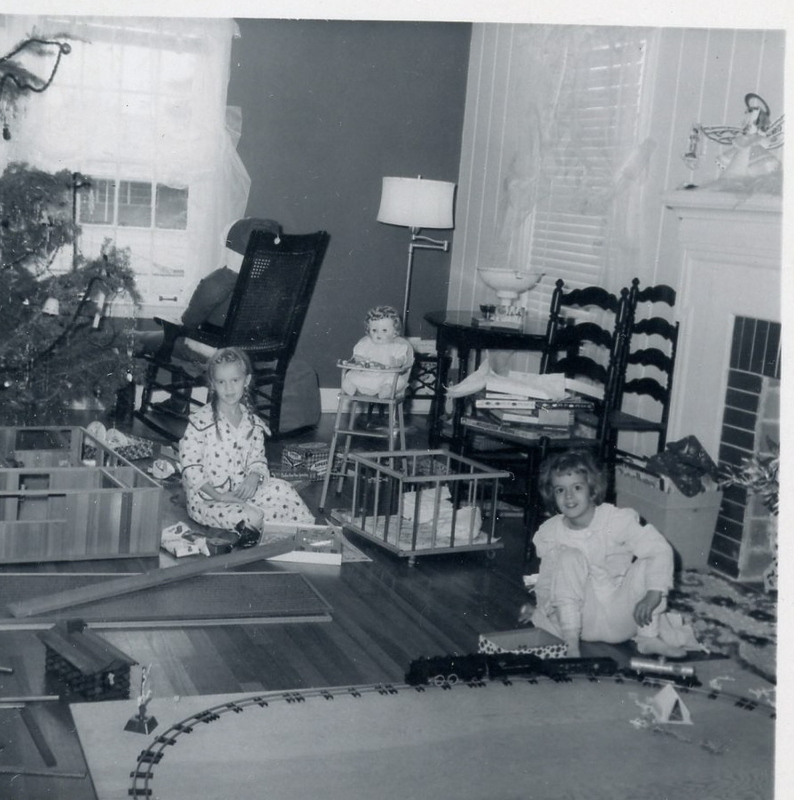 Sara had to be right in the middle of it all, playing with the toys often before we did. I remember not one single Christmas on East Adams that was not perfect, the stuff of Jimmy Stewart movies and Bing Crosby songs. There was so much joy and love and wretched excess, and Sara just reveled in it. And now, from the perspective of adulthood and economic reality, I have no earthly idea how she and Russell did what they did. From the exciting day when she would pick us up at Bankston with the brand new Sears Christmas catalogue in hand until the late Christmas Eve night when all those toys had to come down from the attic (I think they were in the attic; she never confessed), their meager paychecks must have been stretched to the screaming point. There must have been whispered discussions and so many things that they wanted that were put off, just a bit longer, so Cathy and I would never know the first whiff of disappointment on December 25th. I stand in amazement at my parents, yet again. Christmas has rolled around again and last night I saw Sara’s boxed-up Christmas tree and Rubbermaid containers of styrofoam balls out in our storage unit. There were no trips up and down the stairs last Thursday, and I know every one of Sara’s grandchildren would have given their right arm for that opportunity again. Weren’t we all blessed to have Sara Christmas running the show? At this point, I am sad, and that must be shaken off, because the one emotion Sara would not tolerate at this time of year was gloom. If we honor her memory, the refrain “It’s the most wonderful time of the year” must be remembered and honored. That was my intention all along. Serves you right for living somewhere that has coffee shops.